Millions live with uncertainty about their next meal, their next dose of medicine, or where they will sleep tonight. Those living in poverty face endemic insecurity and often suffer in silence. Yet these are the very people to whom Jesus was sent. CBM seeks to follow Jesus and carry His hope to the margins of our world. ﻿﻿﻿﻿Canadian ﻿﻿Baptist Ministries ﻿﻿is an organization which links churches together across Canada and around the world. Convinced that the local church should take an active role in targeting community development and humanitarian needs, CBM is committed to true partnership with churches in their efforts to serve their communities through both their words and deeds. We work by invitation only. We are committed to true partnership where one partner is not subservient to the other. them to increase their long-term capacity. Chagas is a disease transmitted by the vinchuca insect, which thrives in adobe walls and thatched roofs—common materials used in Bolivian homes. Parasites enter their victims' bloodstream and can live undetected for years while quietly destroying internal organs, especially the heart. 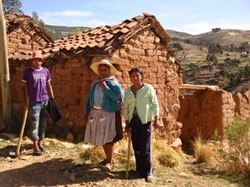 If caught in time, chagas infection can be treated and with simple home renovations the disease can even be prevented. However, the costs for medical care and construction supplies are far beyond the means of the people most affected. CBM’s Chagas project works to address this disease through partnerships with local communities and agencies. Community education on the prevalence of Chagas disease and other health issues. Blood testing campaigns in partnership with the Bolivian Ministry of Health. Professional medical treatment for those infected. Cochabamba is home to both a men’s and women’s prison, in which it is estimated that more than a thousand children live with their parents. Bolivian prisons operate like small communities where inmates must work to purchase food and supplies, while armed guards monitor the perimeter of the complex. Inmates are required to pay to rent their cells or alternatively sleep in an open courtyard with one mat for them and their children. The prison administration acknowledges that many of the child residents often witness violence and even prostitution within the facility but believe their admittance is preferable to leaving them on the streets to face other dangers. All agree that these children will face severe challenges as they grow up behind bars. 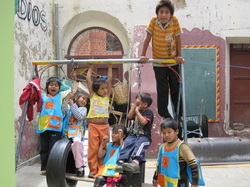 Casa de la Amistad (house of friendship) seeks to meet the needs of these prison children. Every day during the school year, children from the prison will come to the Casa for educational instruction, two healthy meals, mentorship, and a safe place to just be kids. The Casa also regularly brings in doctors, dentists, and psychologists for check-ups. Additionally, the Casa sends councilors into the prisons to mentor parents for reintegration into society and to help them prepare a stable home environment for their children upon their release. Kallie spent a large part of her internship in 2009 working at the Casa assisting with the kindergarten class. Integral Mission Initiatives (IMI) is a unique project that CBM supports in collaboration with three of its core partners: Obades, the Baptist Seminary, and the Center for Integral Mission. These four institutions work together to support local churches in their effort to practice integral mission (the demonstration of Christ’s love through words and deeds). IMI assists churches who operate social projects within their communities by providing both theological and practical development training by leveraging the skillsets within the network of its four institutions. IMI also provides temporary funding to help establish and expand church based . projects to a point where they are self-sustainable. You can visit the IMI . website here.